January is the time of detox and new year’s resolutions. Though our furnished apartments in Toronto offer amenities like fitness centers and aqua spas, sometimes it’s a good idea to switch up your routine and try something new. Here are some interesting new workout trends in Toronto . 1. Indoor Surfing. That’s right. Surfing indoors! Since you might not be able to hit the beaches of Hawaii or Costa Rica, Surfset Toronto has brought the surfing trend to you on Yonge, just north of Eglinton (close by to our properties in North York). The surfboard -balanced on stability balls – is used for toning exercises influenced by yoga and pilates. Try out your best hang-ten pose in one of the most exciting workouts in Toronto right now! 2. Archery Tag. The new Archery District in Scarborough combines your secret loves for laser tag and the Hunger Games in one, sweaty and social activity. Take your bow and arrow after a lesson an d like the classic game of tag, shoot your opponent with foam-tipped arrows in over 5,000 square feet of astroturf. A perfect location to head on out to from your short term rental in Scarborough – The Forest Vista location. 3. Axe Throwing. As much as it’s a fun bonding experience with friends, it’s also a legitimate league (and one way to exercise those triceps). 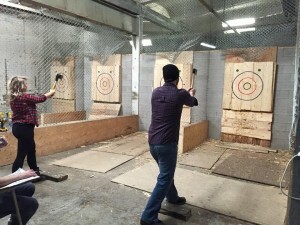 The Battle Axe Throwing League (BATL) has become so popular, it now has two facilities. Make sure to book in advance. 4. Branded Workouts. Big fitness corporations are aligning with local studios and gyms to capitalize on community. In Parkdale, the popular NTC (Nike Training Workouts) for women , at the Academy of Lions are fitness regimens led by world class trainers designed by Nike. Similarly, Lululemon has a number of community events on a regular basis led by their yoga ambassadors. Check individual stores for local events. Here is one example. 5. Obstacle Courses. As an alternative to the Crossfit craze, obstacle courses are a fun way to get a full body workout without the military atmosphere of drills. Popular ones across the city are Monkey Vault and Alpha Fitness that will prepare you for the Spartan and Tough Mudder races that are gaining momentum in North America. What is your workout trend? Do you prefer to work out in a group environment – game setting? If you try one of these new workout trends in Toronto, let us know how it goes!